In Progress - Sale details not complete, payment not fully received and/or vehicle pre-sold prior to it arriving on yard. Unlikely vehicle has been delivered to customer. Completed (default status for all new sales) - All details recorded, VOSA can be printed and signed. Vehicle may be delivered to customer. Finalised - All figures, including profit, finance & insurance details verified and all transactions ready to export to Accounting system. Vehicle likely to be delivered to customer. Although the above is the intended progression of a sale, you can change the status of a sale at any time. The status will not change automatically, it is a choice made by you. Continue to advertise In Progress Sold Vehicles - You can decide if vehicles involved in an In Progress sale continue to be advertised in places like your own website & Trade Me. For example, this might be handy if you still wish to advertise vehicles that have been Pre-Sold prior to them arriving on yard, so you have a backup customer in case the original sale falls through. You can decide per export type if you wish to apply this rule or not. Simply click the Admin tab on the Export you wish to modify then select the "Export In Progress Sales" option to allow In Progress sold vehicles to also be exported. 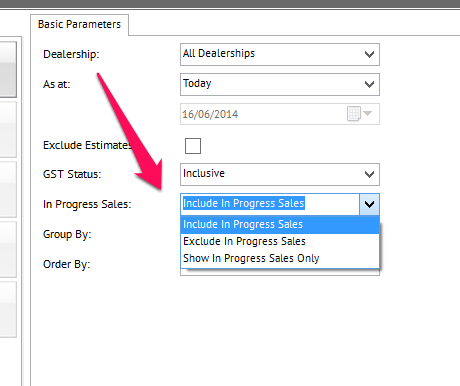 Exclude/Include In Progress Sales in reports - For most of the financial reports available in Motorcentral you can also decide if you wish to include or exclude In Progress sales and their related vehicles. For example you may not wish to include In Progress Sales in your Sales report as these have not been finalised. Similarly you may still want to include In Progress sold vehicles in your stock list until the sale has been completed. For each report simply choose in the Parameters section how In Progress Sales should be treated. You have one of three choices: Include them, Exclude them or display only In Progress Sales. Vehicles sold in an In Progress sale can be identified in the Vehicles tab in an orange colour.